As we move past the mid-point of February, mares are dropping foals in Central Kentucky—and elsewhere—and the 2018 breeding season is off and running. 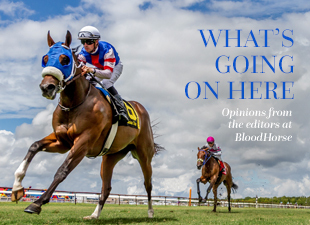 In addition to Lenny Shulman’s panoramic look at the life and times of the late Warner Jones Jr., this week’s issue of BloodHorse features the opener in a series on top stallions, starting with a look at the up-and-down-and-back-up breeding career of Ghostzapper. While the season might prove to be routine for seasoned veterans such as Ghostzapper, a couple of rising stars are worth checking in with as they get into full swing. In a new era the last two breeding seasons have had newcomers who came to the breeding shed off starts in late January. Of course, we’re talking about California Chrome and Gun Runner, who both exited Gulfstream Park’s Pegasus World Cup Invitational Stakes (G1). Two-time Horse of the Year California Chrome, ninth in the 2017 Pegasus, covered some 145 mares last year at the Taylor family’s Taylor Made Stallions near Nicholasville, Ky. Gun Runner, winner of the Pegasus Jan. 27 and 2017 Horse of the Year, has already started his new career, having bred a handful of mares prior to the President’s Day weekend at his new digs at Three Chimneys Farm near Midway, Ky.
For both horses the process from racehorse to stallion was turnkey. “He is phenomenal,” said Three Chimneys COO Chris Baker of Gun Runner. “He ran on a Saturday, and got on a plane and was here Sunday. Monday and Tuesday we were kind enough to give him the days off and let him mosey around the paddock. On Wednesday, we started test breeding. Baker and the Three Chimneys team did get some helpful advice from the Taylor Made Stallion crew. They were grateful for the tips. Over at Taylor Made, California Chrome has started on his second Northern Hemisphere book after shuttling to Chile late last year. Meanwhile, foals from his first crop are hitting the ground. “So far everything is going as we’d hoped,” said stallion nominations manager Travis White. It helps that both California Chrome and Gun Runner were more mature. California Chrome was 6 and Gun Runner 5 when they made the career switch. It might have also helped that both horses had spent some down time at their respective farms while taking a break from training. Familiar surroundings make for easier transitions. “Any time you can do that it leads to better things,” White said. Both are exceptional animals, which should lead to better things as well.